Vader doesn't celebrate Christmas. Likely a personal choice related to his religious beliefs, he's really not into the holiday season (except that one time he celebrated April Fool's Day, but most everyone repressed that memory), but if he did, that self-absorbed Sith Lord would probably wear this sweatshirt. The print design on the front looks like a classic holiday knitted-in pattern which is extra festive while including Star Wars details like a stormtrooper and TIE and X-Wing fighters. 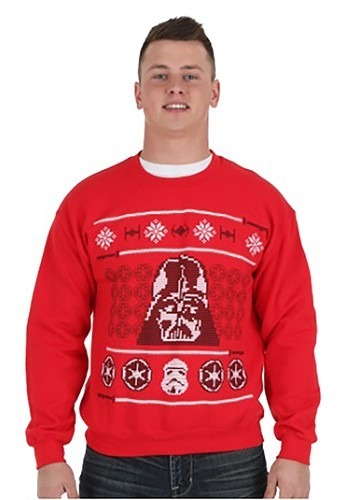 Just think: with just a sweatshirt, you could rule the galaxy for the holidays! Or maybe we shouldn't give you false hope. You could, at the very least, rule your office Christmas party. You know, you could use your force powers consume massive amounts of eggnog and to deliver fruitcake to your enemies. You're evil, after all! LOVED MY SWEATER AND WHERE DID I GET IT!!!! !